New Year, New Goals | Barbie Who? ← Round Two – Begin! Like many people, I try to set a few goals to get my new year off to a great start. One of mine pertains to the blog! It is to refrain from starting any new DIY/craft/whatever projects until I have finished one that I have already started. This will put me at no more than four concurrent projects at any given time. Four does seem like a lot, but it isn’t terrible considering the loose ends I currently have floating around. When I started writing this post, I had four projects on my hook. First is an infant sized Dalek dress I am making for family pictures we will take this spring. The only thing I have left on it is to work in the 10,000 loose ends involved in creating it. I made some bad choices when doing the bobbles, and I will leave it at that. Second, I am finishing a scarf for a friend who lives overseas. It is an entralac scarf, and the body of it is finished. The problem is that I ran out of yarn, so I need to buy more of the super-soft yarn to finish the edging. I haven’t had a chance to drive into the city to buy it, but I hope to within the next week. Third, I am working on a set of commissioned toddler hats based on Elsa and Olaf from the Frozen movie. A lady liked the hats I had made her friend this Christmas, so I am diligently making a set for her. They count as a single entry because I am only working on one element of them at any given time because everything uses the H hook. They’ll take a few days each to finish and will likely be replaced with another commission of some sort. Fourth, I am working on a toddler doll dress to fit a Kelly sized doll. I started it months ago in order to address the widespread nakedness of the dolls I purchased, but I just didn’t have time to finish it. It has been sitting on my bedside table just waiting…. That is until now. I had I free up space so that I could work on awesome things for the blog, so I finished this dress. I think it turned out nicely. It didn’t take nearly as long as the purple skirt I made ages ago, but it was just as tedious. I jotted down the pattern, so if you want to make it yourself you can find it right here. Now that I have the space, I will begin on projects for Peri. 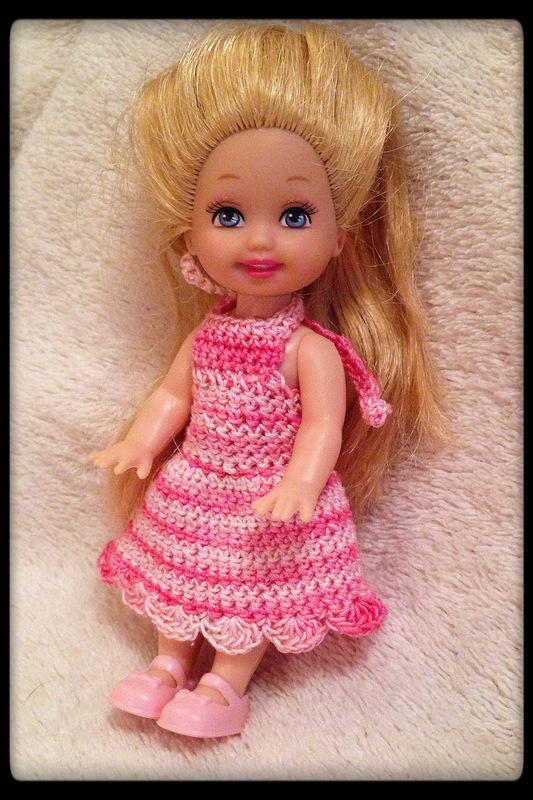 I have found some very promising knit ensembles on the Sticka till Barbie website, but I have never knit for dolls before. I will probably start off with a practice garment before I make something for Peri if I go with a knit pattern. I want her outfit to look polished, after all. I also found a cute pattern for a pair of shorts from an archived blog. I may mix and match the two of them; we shall see. Stay tuned for the next update! I look forward to all the adventures this new year will bring us.